12 homes are currently for sale in this neighborhood. Location: Off Moore’s Mill Road, just past University Drive and before the intersection with Hamilton Road. One owner, Very low mainteance brick veneer home offering a huge master suite with triple trey ceiling and hardwood floors, his and her vanity, large master closet, two story great room with gas fireplace, formal dining room and perfect size keeping room with built-ins and gas fireplace. Kitchen in spacious and open with solid surface tops, shop built glazed cabinets, ceramic back splash. Stainless steel Refrigerator in kitchen will remain. Home is full of Jordan Enterprise quality/custom features including abundance of trim and crown molding (most triple) in every room in the house, spacious rooms and terrific craftmanship through-out. Corner lot with fenced in back yard, large partially wooded lot. Oversized side entry double garage. Carpeted Walk in Attic off on 2nd floor is very spacious. Security System with Door/Windows Hard Wired and 3 panels throughout house. Irrigation system w/ separate meter BONUS: QUALIFIED RESIDENTIAL PROPERTY WAIVER TO MOORE'S MILL CLUB INCLUDED. 1.15 Acre Commercial Lot on Moore's Mill Road at the entrance to Grove Hill 11th Addition Subdivision. Great Location. New Daycare Center and Pet Hotel/Grooming Center are starting construction. A great space to entertain family and friends! This 4 Bedroom sets on a corner lot in the Beautiful Grove Hill Subdivision. The perfect place to relax and enjoy gathering around your private pool! The property includes a heated sun room, a patio area to enjoy the outdoors. The brick home include new wood floors, new appliances including dishwasher, range, microwave hood and range. The updated kitchen includes granite counter tops. The master bedroom includes tray ceilings with his & her closets and sinks, large tub with jets. The subdivision offer many amenities including a club house, walking/ biking trail, playground and neighborhood pond. Enjoy great family living on quiet cul-de-sac in Grove Hill. Single owner, custom built, .97 acres w/large wooded green space between neighbors. Auburn School bus stop w/in sight of home. 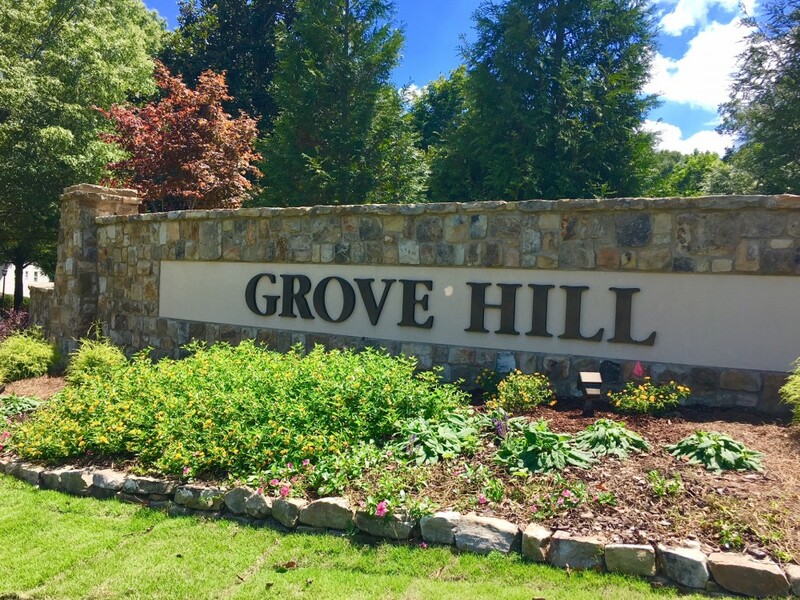 Grove Hill pool & common area are a short walk away. Great all weather outdoor provisions. New carpet, paint, refinishing. Blue Ribbon yard. Backyard playset. Whole house water filtration. Updated HVAC. Conditioned and unconditioned storage areas. Irrigation & erosion control provisions.